This page only shows the first search_hotel_count hotels, so not all 115 are displayed. Please click "View More Hotels" at the bottom of this list. Reservations booked under the "5 Star Signature Package" rate will also include full buffet breakfast for two daily in Cavell's, a $100 CAD resort credit per room/per stay, an authentic local welcome gift, and complimentary basic internet. Reservations booked under the "5 Star Signature Package" rate will also include buffet breakfast for two daily in ARC Restaurant, a $100 CAD dining credit once per stay, and complimentary WiFi. Reservations booked under the "5 Star Signature Package" rate will also include a two hour Eco Tour per person/per stay. All reservations booked under the "5 Star Signature Package" rate or "Rack Rate" will also include a deluxe breakfast for two daily at Market by Jean Georges, a $100 USD hotel credit for CHI The Spa services or for food and beverage outlets (excludes Register Massage Therapist, spa products, and minibar items), and a VIP welcome amenity from the General Manager. Reservations booked under the "5 Star Signature Package" rate will also include a hot and cold buffet breakfast for two daily at Maison Boulud and a $100 CAD hotel credit per room/per stay (not applicable to room and taxes and the spa). All reservations booked under the "5 Star Signature Package" rate will also include Continental breakfast for each guest daily at Renoir (also available through room service), a $75 CAD hotel credit per room/per stay, a welcome amenity, complimentary Internet access, and an automatic room category upgrade at booking, based on availability. Reservations booked under the "5 Star Signature Package" rate will also include full breakfast for each guest daily in The One Restaurant (max CAD $64 credit for 2 people) and a $50 CAD hotel credit per room/per stay. All reservations booked under the "5 Star Signature Package" rate will also include breakfast for two daily in the restaurant (value of CAD 30 per person/per day), a CAD 100 hotel credit per room/per stay to be used in the spa, restaurant, bar or on parking, (hotel credit cannot be used for taxes, tips or room rate, no cash value if not redeemed in full), complimentary internet access and a welcome amenity. Reservations booked under the "5 Star Signature Package" rate will also include full breakfast for up to 2 guests daily in Kost, a $50 CAD hotel credit per room/per stay, a welcome amenity, and an automatic room category upgrade at booking based on availability. Reservations booked under the "5 Star Signature Package" rate will also include full breakfast for two daily in EPIC Restaurant, a $100 CAD food and beverage credit per room/per stay (excludes Benihana & Library Bar), and complimentary basic WiFi. Reservations booked under the "5 Star Signature Package" rate or "Best Available Rate" will also include continental breakfast for two daily, two Signature cocktails in Jetside Bar, and a welcome amenity. Reservations booked under the "5 Star Signature Package" rate will also include breakfast for two daily, $100 CDN hotel credit per room/per stay (no cash value), a welcome amenity, and complimentary WiFi. 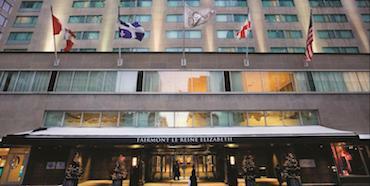 All reservations booked under the "5 Star Signature Package" rate will also include daily American Breakfast for two, a $50 CAD food and beverage credit per room/per stay, a $50 CAD spa credit per room/per stay, complimentary WiFi, and welcome cocktails for two guests. Reservations booked under the "5 Star Signature Package" rate or "Best Available Rate" will also include buffet breakfast for two daily in TOCA Restaurant, a $100 CDN hotel credit per room/per stay, and complimentary WiFi. Reservations booked under the "5 Star Signature Package" rate or "Best Available Rate" will also include buffet breakfast for two daily in Rosélys, a CAD$100 food and beverage credit per stay, and a welcome amenity. All reservations booked under the "5 Star Signature Package" rate or "Best Available Rate" will also include full Breakfast for each guest daily at La Pentola, VIP status, a $75 CAD food and beverage credit per room/per stay, VIP status, and a welcome amenity.